Want to win a free boudoir session with me? Here’s what to do. Find the pinned post on my Facebook page and comment with your session idea between now and Monday evening at 6 pm. I will turn each idea into a graphic representation and upload them into a gallery. Tag yourself in your idea and have your friends come like the page and your photo idea. The gallery will be open until Sunday, November 30th at 9 pm. At that time, I will tally up who has the most likes/votes on their idea. The person with the most likes wins! Now for the nitty gritty. 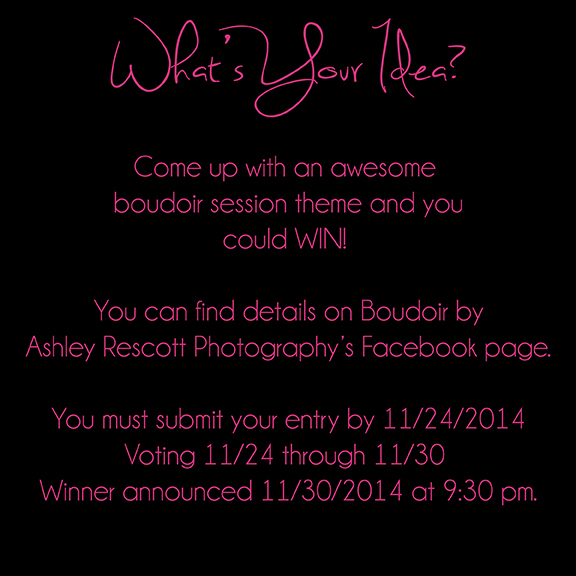 You MUST like Boudoir by Ashley Rescott Photography to enter. People who like/vote must also like Boudoir by Ashley Rescott Photography for their vote to count. You CAN share the photo of your idea in groups, your wall, etc. This contest is in no way endorsed, supported or affiliated with Facebook. You MUST be 18 years old in order to win. Must be willing to sign a model release for photos to be used for portfolio & advertising purposes. Additional prints & products will be available for purchase. Upgraded session available at additional cost. The session will be shot in Fredericksburg, Virginia. It is non-transferable. A Miss Claus package, themed with your suggestion! Professional hair & make up, a ninety minute photo session and a 5×7 book with your images! Talk about a perfect present for your significant other!